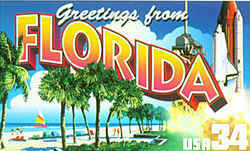 Fossil Agatized Coral, adopted in 1979, is Florida's state stone. The genus of coral for the state stone is Montastrea. However, many types of coral species make-up this colorful coral. Fossil coral pieces are sought by gemstone and fossil collectors around the world. 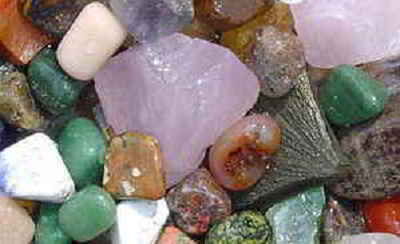 Additionally, fossil coral gemstones are used in beads and other jewelry. Since agate is fairly hard (7 on the Mohs scale) and very durable, fossil coral is suitable for all kinds of jewelry. Silicified Coral, Fossil Coral or Agatized Coral are the remnants of primal Coral Reefs that grew in the warm coastal waters of ancient oceans. 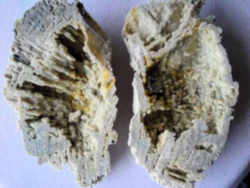 Agatized Coral forms through a process similar to Petrified Wood. Decaying organic materials are replaced with silica rich solutions which, over thousands of millennia, under pressure, will grow into fascinating Chalcedony formations. Chalcedony is a micro crystalline (fine crystals visible only under a micro scope) Quartz that includes stones like Jaspers, Agates, Onyx, Petrified Wood and Flint. 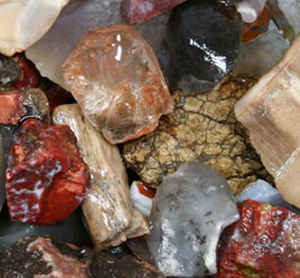 Agatized Coral is one of the hundreds of cousins in this massive gemstone family. Coral will fossilize in one of two ways. 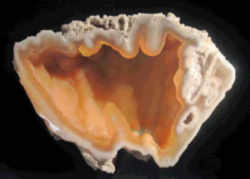 Silica will replace a portion of the Coral, creating geodes, sometimes with brilliant boytrodial Quartz clusters inside. In extremely rare instances water will become trapped inside a geode. In the second occurrence, the Coral is completely replaced by silica creating some exotic specimens. This long process (20-30 million years) results in the formation of a "pseudomorph," meaning that one mineral has replaced another without having lost its original form. In 1979 agatized coral was designated the official state stone. Coral has been used as a sacred tool in many cultures. Romans believed it had great healing powers. You'll find it very beneficial in recharging your energy levels, especially if you are recovering from a physical or mental trauma. In the South Pacific island cultures used Coral to protect their loved ones that had crossed over. The Hindu also use Coral in the protection of their dead. 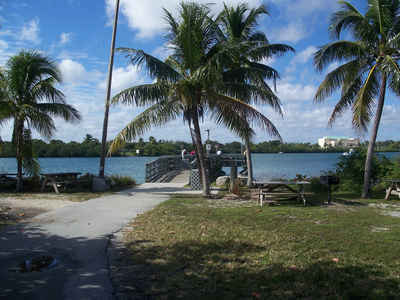 They believe that the ocean is the home of Souls after death and that Coral will protect these Souls from evil spirits. Ancient Mediterranean civilizations believed Coral held the life force of the Mother Goddess. Coral is also helpful for promoting inner peace and quieting your nagging thoughts. You can use it for communicating with past relations or for receiving and understanding Universal knowledge. Because the harvesting of Coral means the killing of a life energy, using it in creative or magical workings can be dangerous. Which makes Agatized Coral the perfect substitute. These fossils carry their life force with them, preserved as vibrant Quartz clones. The Quartz qualities in fossils like Agatized Coral and Petrified Wood make them perfect tools for working on past life memories. Quartz is a recorder of the past, present and future. These Chalcedony fossils allow you to tap into every past that is a part of your history, your Human journey. 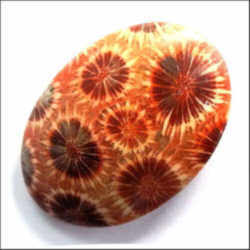 Agatized Coral is a very loving gemstone. It helps magnify your awareness of our common connections. Showing you the power love has to create change throughout your life. Learn the strength to love your enemy, the courage to greet life with a giving heart under the guidance of this gentle crystal. Even under the most aggravating circumstances Agatized Coral can ease your irritability and help you feel better about your fellow Humans. 15.0336 State stone.--Agatized coral, a chalcedony pseudomorph after coral, appearing as limestone geodes lined with botryoidal agate or quartz crystals and drusy quartz fingers, indigenous to Florida, is hereby designated the Florida state stone.